The New Orleans Public Library is committed to serving all neighborhoods and communities in our city. 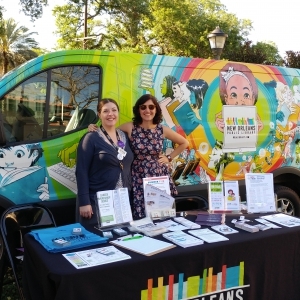 To help us do that we offer a variety of outreach services, presentations, and programs throughout Orleans Parish, from classroom, daycare, and camp visits to neighborhood festivals, community meetings, and more. Please, see below for more information and feel free to tell us what we may be able to provide for you when filling out our Library Outreach Request Form at the bottom of this page. - Age Appropriate Presentation about the library, our services, programs, and the joy of reading. - Age Appropriate Presentation about the library, our services, programs, and the importance of reading. - Storytime or Children’s Activity, depending on the type of event. - Digital Resources Demonstration, depending on the type of event. - We can customize our outreach services depending on the needs of your organization, and those you serve, including library card sign-up, digital resource demonstrations, reader’s advisory, storytimes, adult activities, library information sessions, workforce development and more. - For several years NOPL has had an outreach presence at such events as the Tennessee Williams Festival, New Orleans Poetry Festival, Urban League Schools Expo, Satchmo Summer Fest, Wizard World Comic Con, Audubon’s Zoo-to-Do, Mardi Gras and Krewe of Jingle parades, among others, and we would love to work with you. Please fill out the Library Outreach Request Form to tell us more about your event and needs. After receiving your request, we will send you an email to confirm and discuss any further details or arrangements.